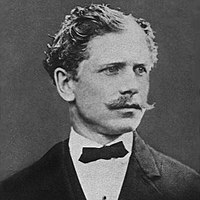 Ambrose Gwinnett Bierce (June 24, 1842 – circa 1914) was an American editorialist, journalist, short story writer, fabulist, and satirist. He wrote the short story "An Occurrence at Owl Creek Bridge" and compiled a satirical lexicon, The Devil's Dictionary. His vehemence as a critic, his motto "Nothing matters", and the sardonic view of human nature that informed his work, all earned him the nickname "Bitter Bierce"